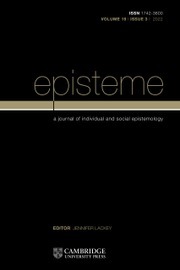 Episteme is a general journal of epistemology in the analytic tradition that invites both informal and formal approaches. Among its primary “traditional” topics are knowledge, justification, evidence, reasons, rationality, skepticism, truth, probability, epistemic norms and values, and methodology. The journal devotes special attention to issues in social epistemology, including testimony, trust, disagreement, relativism, diversity and expertise, collective judgment, and the epistemic assessment of social institutions (e.g., science, law, democracy, and the media). The journal welcomes interdisciplinary approaches to epistemology that borrow methods from allied disciplines such as experimental psychology, linguistics, economics, game theory, evolutionary theory, and computer simulation studies.